Hello December and happy Friday! What's everyone up to this weekend? I don't have any plans, which is a nice change after traveling the past couple of weeks. This month will be pretty busy, so I'll be using this weekend to relax and catch up on work. Last week, I was on the hunt for a new sweater to wear for Thanksgiving dinner. When I came across this cold shoulder number from LOFT, I knew it was the perfect choice. In addition to it being soft and cozy, the ruffle detailing, along with the cold shoulder cut, gives it a dressier feel. Not only did I wear it for Thanksgiving, but I've been wearing it non-stop this whole week. It's the perfect sweater to take you from day to night, so I decided to show you how you can style it both ways. For my everyday look, I threw this sweater on with my favorite high rise black jeans, and finished my outfit with boots and a beanie. Easy peasy, casual and cozy. To take it up a notch for night, I switch out my boots for heels, took off the beanie, and grabbed my vintage Chanel. It's a perfect look for grabbing drinks with the girls, dinner out with the hubby, or even a casual holiday party. If you want to dress this sweater up even more, you can tuck it into a circle or midi skirt, add a pair of killer heels, and put on a bold lip. Done. 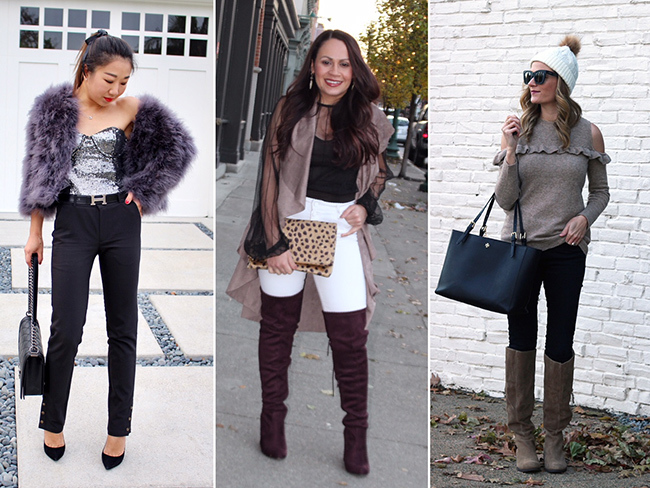 The feature blogger is Jody of Jody's Touch of Style. I'm loving her faux fur vest, and guess what, it's thrifted! Check out her post to see where it's from (one of my favorite places to thrift), and of course, to also say hello! 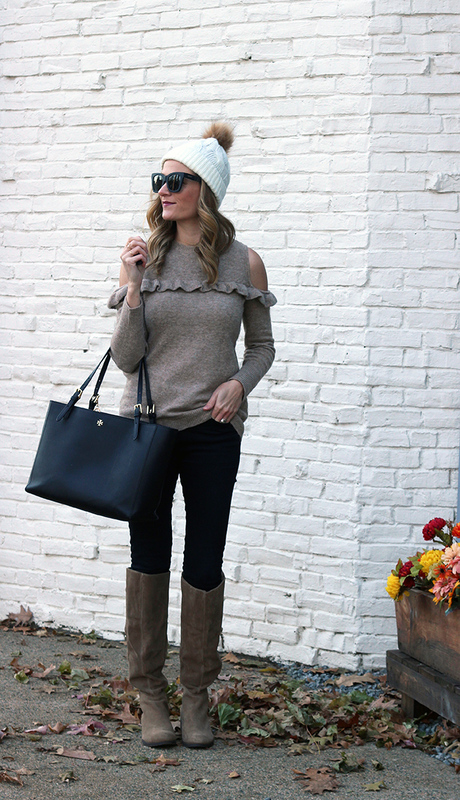 Love this cold shoulder sweater! Too cute Rachael! I love the cold shoulders but also love the color, it's so pretty and neutral! That is the cutest sweater and what an easy and cute switch to heels for night. Super cute, Rachael! I love those boots. Then the studded heels really elevate the whole look, for sure! Have a wonderful weekend. That pom pom beanie is so stinking' cute on you! Love how you paired those fun pumps with this look too! Love your beanie! So excited it's beanie season again! I love the glam with the shoes and bag. Great look! Such a fun sweater, I love both ways you styled it! Love the cute beanie with this look! the sweater is so much fun! Love the cut out detail. I would be wearing that ruffle top all week long, too! I love the color and the subtleness of the ruffles. Very pretty! Obsessed with that sweater! So crazy to think it's already December! Hope you enjoy your weekend! That sweater is fantastic! I love the ruffles and the cold shoulder combination! I love the ruffle sweater, they're my FAVORITE this year!! Join me for a link up on Mondays if you'd like! The color on this sweater is perfect! I love neutral shades because it's a blank canvas just waiting to be styled. You look adorable in the pom beanie! I love those shoes. They are simple stunning!I am addicted to shoes as I have more than 100 pairs. Those outfits you created with the same clothing are simply perfect.You really got most of it creating something that is useful for fall and amazing for a night out. I'd add some booties to as a third outfit idea combined with a knee length overcoat and a clutch handbag for a luxurious look, as well.